His Holiness the Sakya Trichen will bestow Yamantaka, Green Tara, Golden Tara, Long Life, Medicine Buddha, and Vajrayogini Empowerments, as well as lead Vajrayogini Changchog from April 5th - 9th, 2018. For more details and tickets, please visit sakya.net. Through relying upon the power and strength of prostrating to you, may the truth of our words be accomplished. May they be thoroughly allayed. Through method, refuge, purification, and of the pure Mahayana, may the activities of Mara, which completely deceive sentient beings be repelled. In the following video, Lama Migmar Tseten recites Prajnaparamita mantra (30 min) and Prajnaparamita repelling prayer (30 min). By this virtue, having quickly attained the stage of the Jnanadakini, may all migrating beings altogether also be placed upon her stage. In the following video, Lama Migmar Tseten recites Dakini Simhamukha mantra (30 min) and Dakini Simhamukha repelling prayer (30 min). In the following video, Lama Migmar Tseten recites Sitatapatra mantra (30 min) and Sitatapatra repelling prayer (30 min). 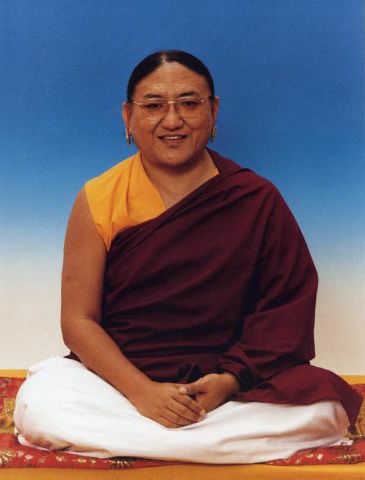 Lama Migmar Tseten recites the King of Noble Prayers Aspiring to the Deeds of the Excellent. To download the text, please click The King of Noble Prayers. In celebration of the Buddha’s birth, enlightenment, and passing away, Lama Migmar leads the 16 Arhats Puja. Lama Migmar and students celebrating the completion of Guru Padmasambhava life size statue. The following video is a trailer of Mangalam Yantra Yoga directed by Khenpo Migmar Tseten & performed by David Magone, the Boston’s Best Yoga Instructor & founder of PranaVayu Yoga. You may also purchase a package of five videos of Mangalam Yantra Yoga that you can watch at anytime as reference & guidance for your daily practice. These videos are available for those who have received Green Tara empowerment, transmission, and instruction from Khenpo Migmar Tseten. Please send an email to mangalamstudio8@gmail.com if you are interested. 21 Tara has been launched as an act of devotion to Āryatārā, and to celebrate the completion of the new series of 21 Tārā thangkhas and the new translation of The 21 Praises to Tārā commissioned by Khenpo Migmar Tseten. Āryatārā (རྗེ་བཙུན་སྒྲོལ་མ་) is a female Buddha venerated by all Vajrayāna Buddhists worldwide. The preservation of these thangka arts is very important because there are many profound teachings, mindfulness meditation, and yoga practices associated with each of these thangkas. We share spiritual practice materials on our Vajrayogini site to support worldwide Vajrayogini practitioners in their daily practices. Please click here for the dates of 10th and 25th day of lunar calendar.